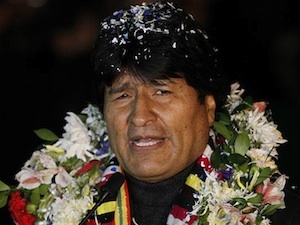 Anger has erupted throughout Latin America over the forced landing of Bolivian President Evo Morales’ plane on July 2, after four European countries refused him permission to fly over their territories, on their suspicion that Edward Snowden was on board the plane. The actions of France, Spain, Portugal and Italy comes on the heels of President Obama’s threats to Latin America to not accept the ex-NSA employe who exposed the massive U.S. surveillance programs. Flying westward to Bolivia after a Moscow summit of gas-exporting countries, Morales’ presidential plane had to fly over Europe. One by one, the European countries refused Morales permission to fly over their territories, forcing his plane to loop back and land in Vienna, Austria. Then, during a 14-hour standoff in Vienna, Austrian authorities tried to search Morales’ plane to assure Edward Snowden was not on board. Many are accusing the United States government as directly responsible for putting Morales’ life in danger in its hunt for Snowden. Leaders of Latin American states are expressing outrage over the violation of Bolivia’s sovereign rights and Morales’ immunity as head of state. On July 4, the 12-member Union of South American Nations—UNASUR—will hold an emergency meeting in Cochabamba, Bolivia, to decide on a response to the aggression. The meeting was requested by Ecuadoran President Rafael Correa. From Venezuela to Ecuador, to Mexico to Peru, to Argentina and to Cuba, leaders characterized the European and United States action as an attack on all Latin America. With Morales in Austria, Bolivia’s Vice-president Alvaro García Linera denounced the “imperial kidnapping” of his president. After 14 hours, Morales’ plane and passengers were allowed to land and refuel in Canary Islands before returning to Bolivia. President Morales stated today that apologies by the European countries will not suffice. As the Latin American leaders of UNASUR arrive in Cochabamba, they are declaring that Latin America must respond energetically and prepare itself against future aggressions.